Aren’t You a Ball of Clay? 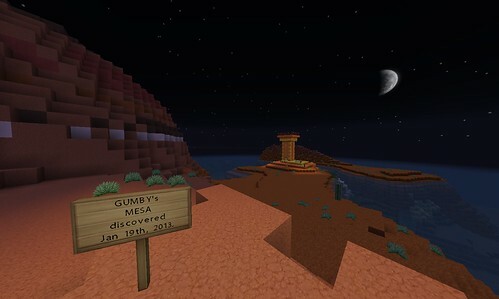 “Gumby’s Mesa Continent: January 19th, 2013” CC licensed BY-NC-SA, shared by Gumby Blockhead on Flickr. However, the call of the wilds has been strong, and so it was that the time came to set out from HorsieField Castle in search of new species of flora and new lands. Planning to travel by horse, and then by boat, I set off with Jack, heading essentially West from the castle grounds. Mesa stands for A-Meza-ing! Check out these majestic colours! “Beautiful Strata” CC licensed BY-NC-SA, shared by Gumby Blockhead on Flickr. Having arrived on what turned out to be a huge Mesa continent, my first construction was a standard-issue Gumby tower of Orange-Stained Clay (“GumbysOrangeTowerOnMesaContinent”) — complete with a small pool. 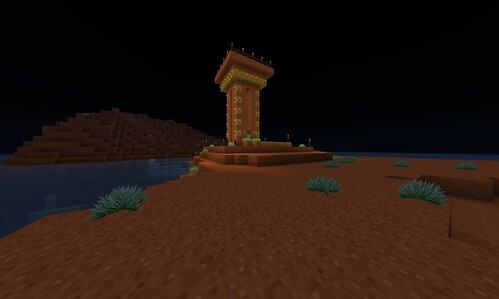 “The Orange Tower on Mesa Continent” CC licensed BY-NC-SA, shared by Gumby Blockhead on Flickr. 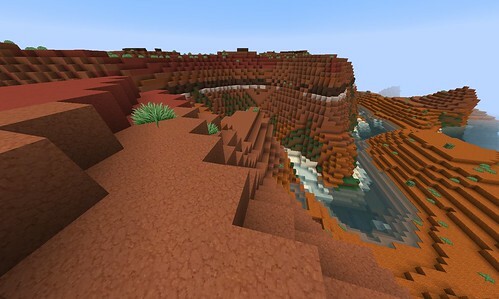 The colours in the Mesa biome are striking. After a rest, I continued to explore, travelling by boat to map out the boundaries of the Mesa Continent, and discovering that the biome extended to a number of large islands in the ocean. Man, that mapping expedition took a long time! Check out this image of the biome, noticing the footprint of The Great Wall of Gumby that is animated into the upper left corner for a size comparison. As the exploration progressed, other towers sprang up. As with other Gumby quests (The Quest for Carrots, The Quest for Mushrooms, The Quest for Horses), it was necessary to journey to new lands to find the new elements — and so travel far and wide is a necessity — and so much fun! Although the Mesa biome still presents an opportunity for continued investigation, and my journeys have resulted in the opportunity to collect a wide variety of new flora, it is unlikely that I will be spending much time at HorsieField Castle in the near future, as there is still so much of the new world to explore. Watch for future back-posts on The Great Wall, The Acacia Forest, and some other events of recent interest. In the meantime, dig and learn! This entry was posted in Survival and tagged beauty, biome, butte, GamingEDUs, mesa, Orange Tower, Red Tower, Red Tower with a Butte View, Survival, tower, White Tower at Horsie Landing on January 21, 2014 by GumbyBlockhead. I tend to spend my MineCraft time on the GamingEDUs Professional Play Server. The server has a number of spaces - the initial Creative World and Nether, a Survival World and Survival Nether, an exciting world-builder space (affectionately called noland) as well as other spaces. When I'm in game, you can find me 97% of the time somewhere in Survival. My initial experience with MineCraft came with the iOS MineCraft Pocket Edition version of the game, and I moved from there to the desktop/server implementation during the spring of 2012 when ds106.us hosted part of their digital storytelling summer session on their Magic Camp MacGuffin server. I am still trying to arrange a Return to Magic Camp MacGuffin. Mojang Releases New Official Minecraft Books!